When using eneloop batteries, it is recommended to use the right battery charger. 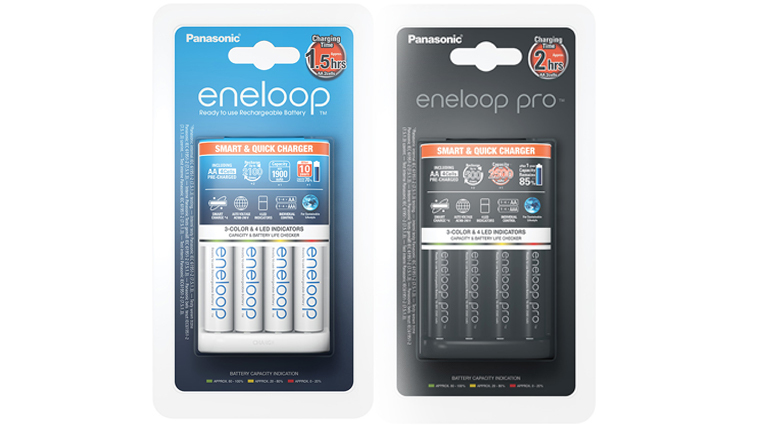 eneloop has specific chargers for its own eneloop, eneloop pro and eneloop lite batteries. Some consumers are heavy users of eneloop chargers, but what is their opinion? Below you can find a list with some eneloop charger reviews to give you an idea of what they think. The first review is written by Erik Vlie for the photographer’s magazine Visual Producer. He reviewed the new flagship charger for AA and AAA NiMH cells, the BQ-CC65. This model is black and has a large LCD screen. The charger is quite big and is provided with a 5V/1A USB port. Up to four batteries can be charged individually. When inserting the batteries, the charger diagnoses them and then it starts charging. In his eneloop charger review he concludes the eneloop charger is top-tier with a good balance between super technical chargers and consumer chargers. The eneloop chargers give lots of information on the LCD screen, they have a special 'refresh' function which is ideal for batteries that haven't been used for a long time. He also states that the chargers are incredibly useful in case you want to know how long your video light or whatever device you are using will be functioning. The next review comes from Ezvid Wiki, a forum that turned into the largest and most comprehensive video wiki and is supported by people all over the world. The article sums up the 10 best AA and AAA battery chargers and is written by Brett Dvoretz. After comparing chargers from different brands and price ranges, Dvoretz decided to rank two of our chargers in his top 10. The BQ-CC55 charger finishes first place. In his review he writes that it can charge one or two cells in just 90 minutes and when fully loaded, it takes only 3 hours. He finds the LED bars which indicate the cells’ progress with red, orange, and green lights very nifty. Dvoretz decided the BQ-CC17 is worth a 4th place in his ranking. He states that the charger is a great bang for the buck, as it includes a set of four high-capacity eneloop AAs, each of which can be recharged up to 2,100 times. Along with these AAs, it also features a convenient flip-up plug and low-profile LED indicators making it even more worth the buy. Only one slight remark keeps it from receiving full marks in this article: the batteries don’t fit very snugly in the charger. However, they are safe to keep plugged in overnight and can be charged one cell at a time. The eneloop charger reviews can be helpful with choosing the right charger for your needs and your device. Don’t hesitate to try them out for yourself!